No matter whether you are a vegan or you tend to eat traditional food, you’ll always miss certain things like dairy products and meat. It’s almost impossible to find a person who doesn’t like ice cream, especially in hot summer weather. Without a doubt this is one of the most preferable desserts all over the world. But milk is the basic ingredient that is used for making ice cream and this is a problem for vegans. Fortunately, there is a solution that allows them to enjoy this yummy sweet product. You’ll be amazed to know that bananas can be the perfect substitute for delicious ice cream which is full of fats. All you need is to mix bananas in a blender, place this mixture into special containers and keep it in the freezer for several hours. Your ice cream is ready! Today vegans have a great opportunity to eat different kinds of food including dairy. If you have decided to join the vegan world, you can make sour cream out of cashews. Just soak them for a while and when they are soft enough blend them adding some water. Your sour cream will not be worse than that produced from cow’s milk. Sour cream is not the only dairy product which can be cooked out of nuts. For instance, vegan cottage cheese and shredded cheese are also available for you. Milk is one of those foods that provide our body with all the necessary minerals and vitamins making us healthier. 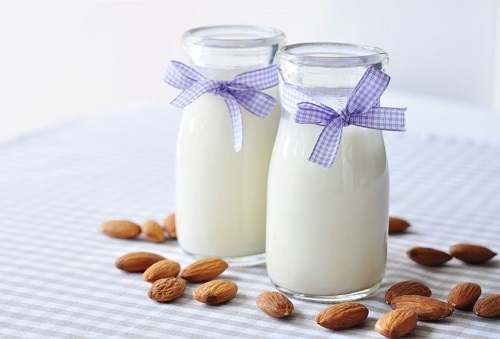 Almond milk is an excellent vegan choice for those who can’t live without this wholesome natural drink. It can be easily found at the nearest supermarket, however, its ingredients may be harmful to your health. That’s why it would be a splendid idea to get your own milk out of almond. The recipe is very simple. You have to soak almonds beforehand, blend them with water and when the mixture is ready, strain it with the help of cheese cloth. Make it a rule to drink this milk regularly and its benefits will soon be evident. Nowadays fresh smoothies and juices enjoy a great popularity among those who choose to lead a healthy lifestyle. Though, vegans were known to incorporate green smoothies into their diet long time ago. By making smoothies you’ll be able to receive numerous nutrients that are contained in leafy greens such as spinach, kale, dandelion greens and Swiss chard. Sure, it’s better to start your day with a glass of green smoothie rather than with high-caloric breakfast. Most of us usually serve salads with yummy dressings that are high in saturated fats. These components have a ruinous effect on your body. Taking into account this fact you have to remove creamy salad dressings from your menu. In this case hemp seeds will be the most suitable decision for you. Mix together a little lemon juice, water and hemp seeds. This counterpart of your traditional salad dressing is very good for you because hemp seeds are an enormous source of omega-3 fatty acids. Honey is truly one of the most delicious and healthiest natural foods. We like to add this sweet product to various desserts, pancakes and simply use it as an alternative to sugar while drinking tea. Being loaded with vitamins and antioxidants honey is considered to be salubrious to our body and its healing properties are immense. On the other hand, honey is an animal food and vegans can’t consume it. To replace this natural sweetener they mostly use agave nectar that is worth trying, even though you are not a vegan. According to the conducted medical researches agave nectar helps to stabilize blood sugar but we can’t say that about other sweeteners. Taco is a Mexican dish which is well-known around the world. I think this is the best food to eat when you are hungry and don’t have much time to cook. In spite of the fact that meat is the major ingredient used for taco, there is a vegan option for those who avoid all animal products. In order to substitute ground beef you have to take chopped walnuts, sprinkle them with spices, add your favorite vegetables and don’t forget about tortillas. Then you’ll be able to savor this awesome vegan food. Vegan cuisines are multifarious and they enable you to experiment with conventional dishes that you like very much. Moreover, if you eat at least some of these foods, you’ll contribute greatly to your health as they have plenty of benefits. Do you like vegan dishes? Which of them are your favorite ones? Have you ever tried any foods mentioned above? If you know other vegan recipes, please, share them with us.